Deterioration of Interracial Relations During Barack Obama’s Presidency 4.6111111111111 out of 5 based on 18 ratings. 18 user reviews. Inter-racial conflict in the US continues to escalate despite the fact that a black president has been leading the country for 8 years. All of the various ethnic groups that comprise American society, hoped that Barack Obama would be able to “sew” together the fabric of a nation torn by racial and social divisions, but racism is still on the rise. This poses a significant threat to US homeland security. Government institutions and big business continue to be controlled by the white elites and the perilous social situation of ethnic minorities continues to be accompanied by an increase in crime. This causes growing racial intolerance at all levels. People are frustrated by the lack of change in inter-racial relations, which has led to a new round of racial violence. The most striking example of the exacerbation of racial conflict is the situation prevailing around so-called police violence. Every case of the killing of an unarmed African American in recent years becomes an occasion for demonstrations, which very often degenerate into riots. The new mass protest movements are thriving and growing in influence, aided by social media. For example, “Black Lives Matter,” which is compared to the ‘Black Panthers’ of the 70s. Despite the lack of talented leaders and clear programs, in such associations, their ongoing radicalization is evident. That was demonstrated by the riots in Ferguson of 2014 and the case of the murder of police officers in Baton Rouge. The indignation of the colored population at police actions is justified. The level of police violence in the United States is quite high. It is known that American cops kill 5 times more people than Canadian police, 40 times more than German police, and 140 times more than police in England and Wales. All segments of the American population are suffering from a disproportionate use of force by police. According to the resource “Mapping police violence”, from the 1st of January, 2013 to the 31st of December 2015, 3,486 people were killed by police, or approximately 1100 people per year. Of these, 571 were Hispanic (16%), 949 African-American (27%) and 1522 (43%) were White. These figures must be compared to the fact that Whites are 64% of the US population, African-Americans are 13% of the overall population, while 16% are Hispanic. However, the divergent behavior of the white population is much rarer due to a higher level of income and social stability. Of course, most of those killed by police were carrying weapons, and the lives of the policemen were in danger. But it is generally thought that US cops are more willing to open fire on people of color, because the policemen believe that the level of criminality and readiness for violence of Hispanics and African Americans is much higher. Additional factors which lead to an increase in racial tensions are racial prejudices and the established practice of cops consistently being acquitted by the U.S. court system. Largely because of the actions of the US ruling elites, there now exists a group of people who are above the law whose members have a license to kill. Shooting at unarmed people, including children and teens, beating of pregnant women, shooting at people with disabilities and other “controversial” actions of American cops all are commonplace occurrences in the United States. The Members of the Committee on the Elimination of Racial Discrimination (CERD) noted that in the United States there exists such inhumane methods as testing experimental medicines on inmates (predominantly African American) in prisons, the forced sterilization of minority women, and numerous incidents of police abuse of power directed towards the non-white population. However, the increased use of cameras amongst both the civilian population and police departments has facilitated increasingly frequent recordings of such cases of violence and has helped in gaining them publicity. That increased awareness that, in turn, has led to the outrage of the African-American population. Many US police forces continue to subject African Americans to more thorough searches and more forceful tactics during arrests. Unofficially, they explain these practices by referring to statistical data presented by such sources as American Renaissance and Daily Stormer. For example, blacks are seven times more likely than people of other races to commit murder, and eight times more likely to commit robbery. They are also three times more likely to use a hand gun, and twice more likely to use a knife. A number of police officers believe that “special attention” to African American citizens improves crime detection rates. However, it has a significant impact on the rise in police dissatisfaction. Although the number of attacks on police and their killings has declined in recent years, experts explain it by the fact that US police are increasingly avoiding “black” neighborhoods, where they can be particularly vulnerable. Moreover, a large part of the US population is puzzled with the public position of President Obama who invariably condemns the actions of the police and grieves for the black victims of police violence, but is silent about the cases of murder of police officers in the course of discharging their official responsibilities. Such a situation leads to an increase in real crime, which is not reflected in official statistics. We should not forget that the number of firearms in the United States recently surpassed the number of inhabitants and according to various estimates there are more than 320 million guns in the US, of which more than 270 million are in the hands of the civilian population. Therefore, a further escalation of violence in the American society, at any time, can lead to very dire consequences. In general, ethnic tensions peaked since the beginning of the Barack Obama presidency. Thus, according to the official FBI statistics, in 2015 the number of white-on-black murders and vice versa reached their highest levels in 2008. The number of white-on-black murders has increased by 12%, while the number of black-on-white murders increased 22%. According to the report of the Chair-Rapporteur of the United Nations Working Group of Experts on People of African Descent Ricardo III Sunga (Philippines), the US maintains “structural racism”. It is a correct assessment of the situation. Despite the fact that the police officers are under the special protection of the state, laws aimed at fighting race discrimination, have the opposite effect of reverse discrimination, harming ordinary Americans. The use of unofficial, but very real quotas for the appointment of people of color at schools and businesses sometimes does not allow qualified “white” experts to get jobs or promotion. In case of conflicts of a civil nature between people with different skin color, they are usually subjected to racial profiling. At the same time, public opinion and the Supreme Court often find themselves on the side of national minorities. On the other hand, the US still has a low level of political representation of ethnic minorities. As of November 2015, there have been a total of 1,963 members of the United States Senate, but only nine have been black, including Barack Obama. Out of 10,884 US Representatives, only 131 have been black. At present, there are no black governors at all. This lack of political representation also leads to more social tension. No improvement has been observed during the final year of the first US African American presidency, instead, considerable aggravation of interracial conflict has been noted, to the point of it becoming one of the most dangerous threats to homeland security. Obama failed to cope with social problems, although he managed to stabilize the economy following the crisis. Still, 27% of African Americans continue to live below the poverty line, an average of 12% do not have steady employment. In some cities this figure reaches 40% and even as high as 50%. The level of culture, education and labor skills is also low. All this leads to an increase in crime among African Americans, and thus foments racist sentiment in society at large. This also leads to an exacerbation of black on black crime. For example, in Chicago, over the past 3 years, 75% of murder victims are young black males and 72% of murder perpetrators are also young black males. Social conditions in such places are affected by the fact that a large percentage of children grow up in broken homes. As far as inter-party competition is concerned, it is obvious that in spite of the election of a black president, the Democrats failed to improve the lives of African Americans. Their criticism of the GOP’s harsh race rhetoric in order to attract voters, this is also an attempt to hide the fact they are not interested in changing the status quo. Paradoxically, only Republicans with their strict “law and order” approach are truly interested in the implementation of certain changes. Although the consequences of their policies in the event of capturing the White House, remain to be seen. Summing up President Obama’s activities in the sphere of interracial relations, we can say that he has not developed a new national idea in order to deal with the problem of racism. US history will remember the first black president not as an idealist fighting for the rights of the oppressed, but as a servant of the ruling white elite and its interests. Divide and conquer (or suppress). “Racism poses a significant threat to US homeland security”, says the above video, but who’s security is this, exactly? Racism indeed poses a threat to the majority of the population. The lack of it, however, the lack of division among people in general, poses a threat to the ruling plutocracy. Racism is the most useful tool for dividing people, and plutocracy won’t give it up easily. While religion and ideology require certain intellectual effort, even the worst moron can recognize his foe at a first glance. This is the main reason why the US plutocracy is covertly inflaming racism at any occasion, and the main reason why Soros is paying for BLM. Speaking of BLM & Black Pahthers- nobody should ever mention these things without also mentioning COINTELPRO. Soros is not “paying for Black Lives Matter.” Black Lives Matter is an movement not an organization. Just because one or two members of the group are seeking bloody money and bourgeois state positioning is irrelevant to the movement as a whole. Black Lives Matter is an organization seeking a response to the virulent anti-Black racism that permeates U.S. society. BLM centers its work on those that have been marginalized within Black liberation movements. It is a tactic to (re)build the Black liberation movement. That is why most racist, conservative politicians who will not admit that Black people are subject to vicious racism in the U.S. hate BLM. On the other hand, most progressive activists know that Black lives are targeted in a more serious, long-standing, structural way than any other lives in the U.S. We love BLM and try and organize white people to wake up and see that struggling for the most oppressed in any society uplifts the entire society. There is no racial contradiction in this, rather in our diversity we are much stronger. “We fool you” category was replaced by the corporate mass media, but everything else is more or less the same. I am a Marxist Leninist and agree with you in most things. However, even this image leaves out Black people. 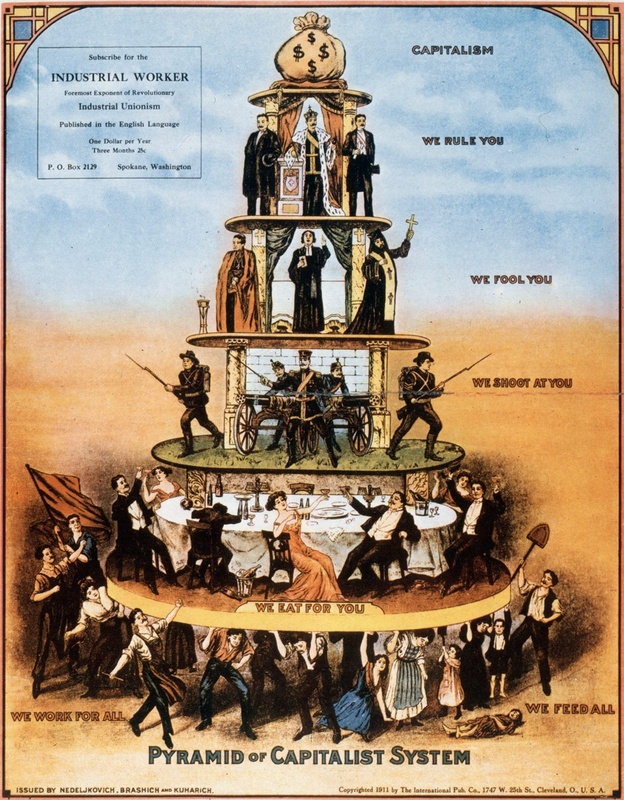 In fact, all the workers at the bottom seem to be white! At least 20% of workers are Black, but you wouldn’t know it from this Eurocentric illustration. Black workers see illustrations like this and know their struggles are not taken seriously. Statistics is a pretty poor argument as far as morality, ethics, and principles are concerned. If you truly are Marxist/Leninist, you should have been color-blind. And, between you and me, Trotsky was a scumbag. A very smart scumbag, his arguments are more than worthy of being taken into account, but still a scumbag. Stalin was more than right about Trotsky-ism. Sorry for the late answer, but I have only so much time to spend on the Internet. However, if you are still interested, I’ll gladly discuss this matter further with you. Obama proved it’s impossible to be friends with the elephant in the room (billionaires and fractional billionairs) and the people its stomping on. The video points to a deficit of blacks in congress. I have to ask: WOULD ANY SANE PERSON WANT TO PUT BLACK LIVES MATTER IN THEIR GOVT OFFICES AND HALLS OF POWER? Seriously? The people who burn down their own neighborhoods when they get mad? The most violent people who play “the knockout game” on unsuspecting whitey? The people who largely drop out of school and think that society owes them, and when they don’t get what they want – they get violent and riot as a group? The people who won’t even try to speak English, preferring “ebonics”? THESE KINDS OF IRRESPONSIBLE PEOPLE WILL NEVER GET MY VOTE…regardless of the color of their skin. Especially after obama. Nice one trid2bnrml, well said. This shows a surprisingly poor understanding of Black life in America. You will never find a single youth that plays “the knockout game,” Black or White, who is part of a political organization. These are poor youth with no guidance and belong to no organizations. Are you claiming that Black youth drop out of school in order to get welfare? There are many studies on why Black youth disproportionately fail to graduate high school and not one has found “in order to get welfare.” There are lots of studies if you want to learn why things happen. I hope you sincerely want to make the world a better place. This video is dedicated to a very important and controversial topic. Essentially, It has been prepared by SF members from the United States. SF will be glad to post more on the topic if the emailed opinions (analyses) are fact-based and detailed enough. In order to put the racial issues in the US in perspective all one needs to do is look at Africa. Africa is a violent cesspool of tribal warfare, and the US is little different. Whites, unless Latinos are counted as White, are no longer the majority in the US. When the money runs out, and the pampered, and privileged minorities turn on each other it’s really going to become interesting. In time America will serve as a catastrophic example of the failure of multi cultural/ethnic societies. Well said. I made a similar case here: http://wsenmw.blogspot.com/2016/10/i-dont-get-down-like-that.html Then I took it a step farther suggesting Hillary Clinton would be more of the same if not worse which why I cannot figure Why do impoverished Black people support Hillary Clinton? The us institutions have been formed in a colonial manner. Certain easily identifiable groups have been targeted for cultural destruction, breaking up their traditional support systems and world view, then used as a work force, or moved or eliminated. The techniques have been refined by neo cons and neo liberals. The target communities may be white, or religious, or any affiliation or world view which does not support the aggression and world view of the post capitalist `culture´. The chicken do come home to roost. Linh Dinh understands this issue objectively and goes beyond the cliches. MSM actively supports anti-white bias, as whites are most in the way of the NWO Deep State. This is unbelievably ignorant. Please stop hating on Black people. God made us all equal and to be in right relationship (holy). Let it accelerate even further!